Stay a while and listen! Last night while I was in a discussion with my boss reports came in over the phone from shooting and grenade attacks across the city. Most employees had already gone home for the day. The rest were advised to stay in the office until it became clear what was happening out there. The attacks seem to have been restricted to the Colaba area where most of the tourists and foreign businesspeople reside. Taj hotel, Cafe Leopold, VT station, ... all places I've been to many times. Fortunately nothing happened in the more suburban Malad area where I live and work. This morning the situation is still unclear. We're not sure what's going on at the Taj hotel. A hostage situation is ongoing. Roads and trains are already opening up again. I hope the Indian police and military goes after this evil scum with everything they've got. Take no prisoners. Despite the financial trouble of Las Vegas Sands Corp, construction of Singapore's $4 billion Marina Bay Sands casino continues around the clock. Over the past years I saw as Marina Bay got reclaimed, then how hundreds of pile drivers set a foundation in soft sand, and now the construction of massive buildings. Each time I visit Singapore I try to see how work has progressed. Cropped to less than half of the picture. Click to download the high resolution version. For this image I used Photoshop CS3's Automate > Photomerge feature. Couldn't be easier to use. The quality is okay but some retouching should be done to get the best results. Last weekend I finally bought a DSLR. The Canon 450D with the 18-55mm IS and 55-250mm IS lenses. A visit with my better half to Singapore's East Coast recreational area provided interesting material to shoot. 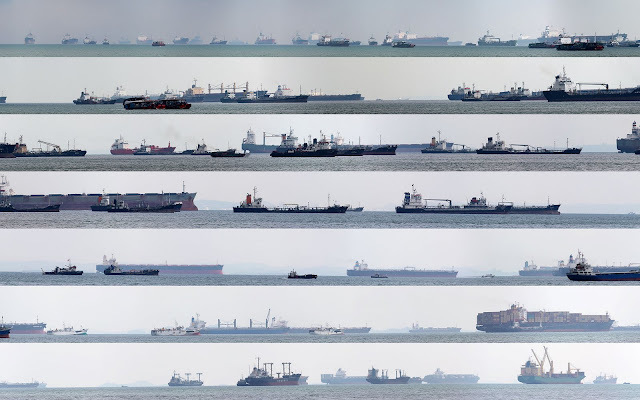 My favourite result is this panoramic view of ships coming and going at the world's busiest port. It looks like a blockade of the island as they form a wall around the small island city state. Download the full resolution image at 50,000 x 1280 and 17 megabytes in size. I guess 64 megapixels should be enough for anyone. It's a composite of 40 images taken in less than 2 minutes without tripod. I used autostitch to merge them in 3 groups, as the utility was unable to process the entire set at once. Then I crudely glued them together using Photoshop. There's a lot of mismatched colour in the first 5-6 shots as I didn't tweak any autostitch settings nor take time to set up the camera correctly. Update: I made a 1920x1200 striped version of the full size image above. This fits any 16:10 widescreen display. A small part of the left side was cropped out and the sky/water has been trimmed. The 7 layers form a single continuing image. Download the high quality striped image. It weighs in at just 1.6 megabytes. Personal Blog by Sebastiaan Deckers is licensed under a Creative Commons Attribution-Share Alike 3.0 License.